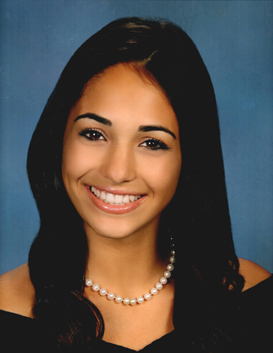 Courtney Brooke Lopez is a senior at Freedom High School in Tampa, Florida and will graduate with honors having a weighted grade point average of 5.6 and a district GPA of 3.6. Courtney has consistently challenged herself with advanced placement courses in English, math, history and sciences. She serves as treasurer for the high school chapter of The National Honor Society. Courtney participates in “Best Buddies”, which she is partnered with a handicapped student that she interacts with throughout the year. Through “Cupcakes for a Cure”, she helps raise money for students with A.L.S. In addition, Courtney was a J.V. and Varsity cheerleader. Outside of school, Courtney has volunteered in her community logging numerous hours at the Humane Society of Tampa Bay and a Tampa Bay Area rescue group called Cat Crusaders. Since five, Courtney has been a member of a non- profit entertainment group, Entertainment Revue. The group is a singing and dancing ensemble consisting of girls’ ages 5 to 18 years. In addition to being a twelve year member of this prestigious group, in her Junior and Senior year she has taken on the role of assistant director. Courtney has been accepted to the University of South Florida where she will major in Biology with plans to continue her education by attending veterinary school. Courtney is the daughter of Captain Morris Lopez III and wife, Yvette.